Job security and parity with permanent teachers — 22,000 guest teachers who have been protesting for two weeks now have made their demands loud and clear. But circumventing the teacher recruitment system and navigating the government-L-G tussle is a tall order. “It feels as if we are daily wage labourers. Hum toh mazdoor hain,” said a teacher, echoing a common refrain from thousands of contractual teachers who took to the streets on March 1 after their contracts ended, en-masse, on February 28. “It is not just a weakness but a crisis in the education system.” This is how Deputy Chief Minister Manish Sisodia, who also holds the education portfolio, described the situation of contractual teachers in government schools. As 40% of the teaching strength of Delhi government schools enters the third week of protests demanding job security, the flashpoint has exposed a chink in the Aam Aadmi Party government’s proudly showcased school education system. The protest by 22,000-odd contractual teachers — which has moved from outside Sisodia’s residence at Mathura Road to Lieutenant Governor’s office at Civil Lines to the BJP’s Delhi state office at Pandit Pant Marg — has also escalated into a poll issue, with leaders of all parties scrambling to extend support, and platitudes. Closely tied to this push and pull, stakeholders warn, are the futures of lakhs of government school students. The practice of hiring contractual teachers, which began as a “stopgap arrangement” in 2010, as per the Directorate of Education (DoE), has grown into an institutionalised practice over the years. The DoE had started appointing guest teachers to meet the shortage of regular teachers due to sanctioned posts lying vacant. Currently, of the 66,736 sanctioned regular posts, 22,000 are filled by contract teachers, and 38,926 by regular teachers. have taught as “guests” for well over five years now. One such primary teacher, at a Sarvodaya Kanya Vidyalaya in Central Delhi, started in September 2014. “Like daily wage labourers, we get paid for every day we register attendance in school. Sundays, second Saturdays, two-week winter holidays, public holidays throughout the year mean no pay. When it’s the festival season, I don’t know whether to be happy that I can spend time with family or upset that I will not earn,” she said. “There is no concept of sick or casual leave, and we work under the threat that our contracts can be terminated. We also do the most number of invigilation duties during examinations, most of the administrative paperwork, just out of self-preservation,” she said. But she is willing to go the extra mile — if it means an assurance she will not lose her job arbitrarily. That has been the demand of this agitation. As their contracts ended last month on the directions of a High Court order, which was hearing a contempt petition against the non-recruitment of regular teachers, guest teachers poured into the street and outside Sisodia’s residence, demanding a policy to ensure job security. On March 6, the Delhi Cabinet, in an emergency meeting, decided to adopt a policy under which current guest teachers “shall continue to function with the DoE till they attain age of superannuation as determined by government for its regular teachers” — which is currently 60 in Delhi. The government then passed the baton to the L-G, stating that it had played its part and the onus was now on him to approve the policy. As the protest shifted to Civil Lines, a delegation of teachers who met the L-G said he had told them he couldn’t approve this measure as he was not presented with a fleshed-out policy document, but with a mere letter. Frustrated, the teachers shifted once more, this time to the BJP’s office in the hopes that the party could push the approval of such a policy. The issue continues to be on hold, and the protest, though diminished in numbers, continues. The office of the L-G House did not respond to calls seeking a comment. Until 2014, the process of recruitment of contract teachers was decentralised, taking place at the school level. Every time there was a need, a fresh process was conducted through new applications. In 2015, the Delhi government altered this process and initiated the practice of “extension” of teacher contracts, arguing that this would help establish continuity. Professor Janaki Rajan, a professor in education at Jamia Millia Islamia, said this systematisation of the contract teacher arrangement led to a situation wherein teachers started citing experience to ask for circumvention of the system of permanent recruitment through DSSSB (Delhi Subordinate Services Selection Board) examinations. Recruitment of permanent teachers is currently done through examinations conducted by DSSSB, every time the DoE or MCD flags vacancies. In a 2001 order, the HC had drawn out a schedule and timeline for yearly recruitment of regular teachers. The promise of converting existing contractual teachers into regular ones has often been made by the AAP, including in its 2015 manifesto. “This was clearly a political strategy and this group of teachers was a cadre created by AAP. They voted for the party and were rewarded with extensions. Now, they are asking for permanent conditions without going through the standard procedure of DSSSB exams. This is not allowed for any public position; why should it be the case in education? It is not possible under the rule of law. I have full sympathies for conditions in which these teachers are working but they need to have the competitive edge,” said Professor Rajan. This was echoed by the principal of a 3,500-student school in North Delhi, which has 79 contract teachers and 45 permanent ones. “A lot of these teachers have worked hard, no doubt. But the current situation of having a majority of contract teachers is compromising the quality of education and not doing justice to children. Quality teachers can pass the DSSSB exam filter and become permanent, like some of ours have. Unfortunately, most of the existing contract teachers do not make the cut,” he said. A recent submission by DSSSB in the HC stated that 77% of the current contract teachers did not achieve minimum qualifying marks in examinations it held against 9,556 vacancies in 2018. Protesting teachers argue that their work schedule does not give them enough time to prepare, and their experience and merit, on the basis of which they were offered contracts, should be enough to give them permanent positions or uninterrupted contracts. But several heads of schools and education experts warn that such a move would be unfair, and could block avenues for fresh aspirants trying to enter the system through fresh contracts and DSSSB recruitment. Promises to contract teachers have been many, and several attempts have been made by the current government to regularise them. In 2015, it passed a Cabinet note approving additional weightage in DSSSB exams to contract teachers, and also granting them age relaxation for permanent positions. While the provision for age relaxation was approved by the L-G as a one-time measure, he did not permit giving additional weightage, citing violation of principles of equality and equal opportunity. In October 2017, the Delhi Assembly passed a bill to regularise 15,000 of them, but it didn’t get the L-G’s nod. Protesting teachers said the government also held out the promise of fixed salaries as opposed to daily wages. “Addressing us at Chhatrasal Stadium in 2017, Chief Minister Arvind Kejriwal had promised fixed salaries. 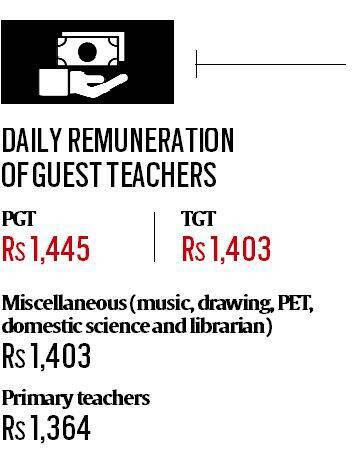 While that hasn’t happened, our daily wages have been doubled,” said a contract teacher at a North East Delhi school. According to Sisodia, the need to hold on to contract teachers was fuelled by the need for continuity, and because “DSSSB was defunct between 2007 and 2014 and did not carry out any regular recruitment”. “If at that time the opportunity would have been created for them to qualify as permanent teachers, they would have done so. Instead, only contract positions were taken on, and they completed several years this way. The government has been unfair to them. If they are working without job security, they are not able to carry out their work fruitfully. So it is not just an injustice to them, it is an injustice to students as well. It’s a problem for the education system. That’s why we’ve been trying since the beginning to make them permanent,” he said. “As education minister, my problem is that I’m not able to create certainty within my workforce. This responsibility has been given to the L-G and he’s not serious about it. What do I do?” he added. As the recent crisis unfolded, over 1,000 Delhi government schools were left in the lurch in the middle of exam season, with not enough hands to conduct invigilation and paper correction. The DSSSB has asked for time until April-May to fill 9,556 vacancies, while DoE has ordered that guest teachers shall continue working till March 28 — the date for the HC hearing, when the Directorate will ask for an extension of the contract teacher arrangement. But many protesting teachers refused to report to duty until a concrete policy is cleared. After sustained pressure from schools and threats of discontinuation of services, however, most teachers have now returned to work, with the protest continuing after their shifts end. “We struggled with exam duty but made alternative arrangements like conducting examinations in the open so fewer invigilators could oversee a larger number of students,” said the principal of a North West Delhi school. The deeper malaise, however, is a public education system without robust recruitment procedures, even as classrooms continue to be built. Around 9,000 new contract teachers were recruited last year after construction of 8,500 new classrooms. With 11,000 additional classrooms being planned, the government will be looking to recruit an even larger number in the near future.